Unlike many who dive headfirst into the restaurant biz with a place of their own, Kevin Wisniewski is not a professional cook. That’s not to say that the Emsworth native doesn’t know his way around a commercial kitchen, especially when it comes to breakfast. Having worked as a morning cook for a chain of family restaurants, Mr. Wisniewski can sling hash — not to mention fry an egg or flip a pancake or, if you’re more in the mood for lunch, grill a burger — with the best of ’em. Just ask his family of five, for whom he’s cooked hundreds of early-morning meals over the years. A lifelong resident (and 1991 graduate) of the Avonworth School District, he also has his finger on the pulse of the North Boroughs’ culinary scene. And what it was telling him and his wife, Rachel, an agent with Stonebridge Real Estate, was that people longed for a local place where they could eat a cooked-to-order breakfast. 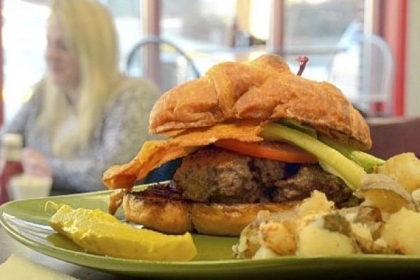 Emsworth isn’t exactly a desert when it comes to eating out — you can find Chinese at House of Lee, wings at The Emsworth Inn and upscale Italian at Cafe Notte — but its restaurants hardly cater to the breakfast crowd. Other than The Fire Escape coffee shop on Church Avenue in neighboring Ben Avon, where early risers can pair a bagel or pastry with a cup of La Prima coffee, “There’s not any options for sit-down in the morning,” he says of the tiny communities that line Route 65 between Sewickley and Bellevue. An opportunity was there for the taking. 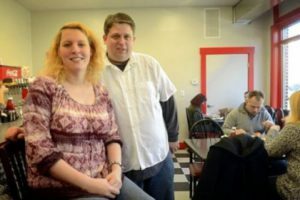 Still, Mr. Wisniewski admits he’s taking something of a gamble in opening Chev & Rachel’s Family Diner at 233 Center Ave. in Emsworth, the first eatery in recent borough history to crack open its doors at the crack of dawn (6:30 a.m. weekdays). While he worked at Shannopin Country Club for 20 years after graduating high school, it always was as a front-of-the-house person. And his time behind the grill at King’s Family Restaurant? It really only amounted to a few months of training, says Mr. Wisniewski, who took the job after a career change in 2011 with Norfolk Southern didn’t go as expected. “I was going to become a train conductor, but I hated it,” he explains. He and his wife had always harbored thoughts of opening their own small restaurant, though, so when he quit the railroad job a little over a year ago, he decided now was the time to take the chance. It wasn’t quite as crazy as it sounds: The windowed storefront the diner’s tucked into actually belongs to his father, John, who had a barber shop there from 1972 to 2000 and was only too happy to have him take over the space. “He was like, ‘You know all the people there, and there’s so many kids,'” Mr. Wisniewski says. The diner officially opened for business this past Saturday, and there’s every indication people were hungrily awaiting its arrival: even during its “soft” opening early this month the restaurant drew large crowds on weekends, “and I can’t tell you the number of high school kids who come in before school,” he says. You can either go old-school and sit at the counter, or take a seat at one of four tables. Future plans include having guest cooks and chefs prepare favorite dishes for an hour or so on weekends. The couple also are planning on getting into ice cream this summer by offering sundaes and milkshakes. “We’re still learning,” Mr. Wisniewski says of the business. “But everyone, including the borough, has been great with the idea. Chev & Rachel’s Family Diner, 233 Center Ave., Emsworth, is open 6:30 a.m. to 1:30 p.m. Mon.-Fri; 7 a.m to 1:30 p.m. Sat. ; and 8 a.m. to 1 p.m. Sun. (breakfast only). Phone: 412-496-3568. 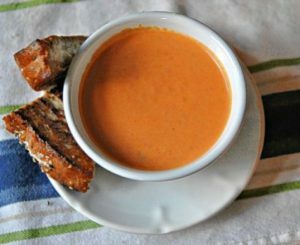 Soup for lunch or dinner always is a good idea when temperatures start to dip, and nothing quite hits the spot like the creamy, savory tomato concoction of our childhood. One spoonful and you’re instantly transported back to a time when Mom tucked you in at night, Saturday morning meant the couch and cartoons, and said soup was carried to school, with a baggie of saltines, in a Thermos. The taste is so mm-mm good that Campbell’s, who introduced the world to its condensed tomato soup in 1897, sells enough cans to be eaten by more than 25 million people at least once a week. Yet why go the canned route when making tomato soup from scratch is so easy? Not to mention packed with flavor, depending on what you stir into the pot along with the tomatoes. One of Chef Kevin Sousa’s recent specials at Station Street in East Liberty was a fiery Tomato-Sriracha Soup crafted from sake, cream and garlicky Sriracha, the sinus-cleaning hot sauce made with fresh red jalapenos, garlic powder and vinegar. Yet what’s tomato soup without an accompanying grilled cheese, all toasty brown on the outside and oozing like a lava flow with melted cheese? Get people talking about this magical combination, and they tend to wax poetic. That includes those who wouldn’t get near a fresh tomato if their lives depended on it, says Sara Raszewski, co-owner of Soup Nancys, which sells its from-scratch homemade soups, including a to-die-for Tomato & Orange, at Pittsburgh Public Market in the Strip District. Mr. Sousa is another who grew up on tomato soup and grilled cheese — specifically, canned tomato soup thinned with milk or water and sandwiches made with soft white bread and bright-orange, processed American slices. “For me, this combination either meant that I was home from school sick (always a good thing) or that there had recently been cold weather fun (sled riding and such),” he remembers. Now a parent himself, he’s shared the classic combo with his own kids under similar circumstances, almost as a right of passage. “Sitting there in long underwear at the kitchen table while your extremities tingle and itch as they thaw out, all over a steamy bowl of tomato soup … that’s Americana,” he says. 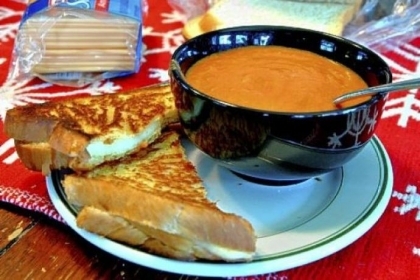 Small wonder, then, that grilled cheese and tomato soup are hot sellers on local menus. Restaurants as varied as Crested Duck Charcuterie in Beechview (which offers a grilled cheese du jour) to Casbah in Shadyside offer the duo. So does Industry Public House in Lawrenceville, where a grilled “Electric Cheese” marries aged white cheddar with fresh mozzarella on raisin challah. In the Post-Gazette snack bar, it’s made “Texas” style with thick slices of Italian bread and bacon — perfect for dunking in the pale-orange cream of tomato soup it’s paired with. The combo has enough culinary cred that last year, Larry and Doreen Gunas of Evans City started Oh My Grill, a food truck serving specialty grilled cheese sandwiches with homemade “dipping” soups. Along with daily specials, the menu includes a “build your own” sandwich with a choice of three cheeses. The bestseller, says Mr. Gunas, is a grilled cheese with smoked gouda, white cheddar, caramelized onions and applewood bacon, and served with potato or spicy tomato soup. Can’t wait that long, or maybe just looking for an updated version of Kraft American on Wonder bread (which incidentally, tastes just as good today as it did 30 years ago)? You also can whip up something pretty spectacular at home, pretty easily. You want to choose a cheese that is going to melt well without becoming a gloppy mess. (Remember, you’ll be eating it with your fingers.) Low-fat cheeses such as feta or queso panela don’t melt as much as crumble, and creamy fresh cheeses (super-soft goat cheese, mascarpone, etc.) tend to get runny when heated in a pan unless they’re paired with a cheese that’s a bit more robust. Cheddar, muenster and American cheese are perennial favorites, and you also can’t miss with Gruyere, a sweet-salty hard cheese that pairs especially well with caramelized onions. Other excellent choices include mozzarella, provolone and Swiss (terrific with roasted or fresh sliced tomato) and softer cheeses such as brie or havarti, a creamy Danish cheese that goes beautifully with fresh or dried fruits like apricots. The list of acceptable cheeses goes on and on, which for many cooks is a good thing, because the best grilled cheese sandwiches very often ooze a luscious mix of two or more varieties. Recently at Station Street in East Liberty, for example, Mr. Sousa paired brioche with slices of cheddar, American, bleu and provolone cheeses. Sourdough, baguettes, rolls, raisin bread, rye, whole-grain — it really depends on personal taste and what’s available at the market. Whatever you fancy, make sure the slices aren’t too thin or the sandwich will get brown and crispy before the cheese inside has time to get gooey. Unless, of course, the cheese is so soft or thin that it melts quickly — then you want thin bread. Super-thick slices also are doomed to fail, because the cheese won’t get melty. 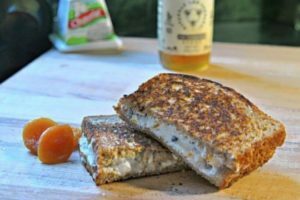 When in doubt, a good-quality plain sliced white bread with a firm close-textured crumb, Ms. Spieler writes, “is the best thing most grilled cheese sandwiches could want.” That said, cheddar is wonderful on raisin bread and Swiss sings on a hearty rye. Don’t be afraid to butter up when it comes to assembling the sandwich — the bread, that is, and not the nonstick or cast-iron pan or griddle you’ll be cooking it in. Put the sandwich in a pan already sizzling with butter or oil, and the fat will immediately be soaked up by the bread in a random, blotchy manner, notes Laura Werlin in “Grilled Cheese, Please! 50 Scrumptiously Cheesy Recipes” (Andrews McMeel, 2011, $16.99). Plus, you’ll be making a deep-fried sandwich. Go for slow, even cooking rather than a fast fry to assure proper melting, and make sure there’s not too much cheese hanging over the edges of the sandwich — the crispy, cheesy bits are messy. If you weigh down the sandwiches with a lid or saucepan, or simply press on it every so often with a spatula, the result is a crisper, more compact grilled cheese. This is one sandwich you can’t really cook ahead of time, because it’ll get soggy when you reheat it. But you can assemble it in the morning and store it in the fridge. That way, it’ll be ready to cook when you walk in the door after work or pile into the kitchen, cold and hungry, after an afternoon of sledding. To really play it smart, also have a pot of tomato soup simmering on the stovetop. “This soup recipe is great for grilled-cheese dipping, and it’s terrifically easy since it does not call for stock, and only needs to simmer for 15 minutes,” writes Sara Raszewski of Soup Nancys. The addition of baking soda helps to neutralize the acidity of the tomatoes and orange juice. She suggests serving it with a “fancy” grilled cheese sandwich made from provolone or pepper jack, fresh basil, and raspberry-habanero jam. Melt butter in saucepan over medium heat. Saute onion until translucent. Add garlic and saute 1 more minute. Add tomatoes (and their juice), salt, pepper, thyme and baking soda. Turn up heat and bring to a boil. Reduce heat. Simmer 15 minutes, stirring occasionally. Add orange juice and cream and heat through. Adjust seasonings to taste and serve hot. Makes 4 to 6 servings. If you like things spicy, you will love this soup, which kicks it up a notch with Sriracha, a garlicky hot sauce. It’s addictive. You can find inexpensive sake (for cooking, not drinking) at Lotus Food Co. in the Strip District. In a heavy bottomed stainless steel pot over medium-high heat, brown garlic cloves in oil. Add tomatoes and juice, bring to a simmer and reduce by half. Add sake, and reduce by 1/3. Add chicken stock, and again reduce by 1/3. Add heavy cream and Sriracha, and puree until smooth. Season with kosher salt and more Sriracha, as desired. The original recipe calls for cooking this sandwich in a sandwich press, which I don’t have, so I grilled it in a hot skillet. Make roasted onions: In a skillet over medium-high heat, add the olive oil and onions and stir vigorously to avoid scorching. Add oregano and season with salt and pepper. Continue stirring until onions have a deep brown color. Reduce heat and continue to cook until onions are soft, 30 to 45 minutes. Use immediately or refrigerate for up to 1 week. Make sandwich: Place 2 slices of cheese on each of 4 slices of bread. Follow with a generous amount of onions and the other 2 slices of cheese. Close the sandwiches. Brush outside of sandwiches with a little olive oil and place in a hot pan over medium-high heat. Press the sandwich by placing another heavy pan on top and reduce heat to medium-low. When bottom of sandwich is golden and crusty, and the cheese has started to melt, flip the sandwich and grill on the other side. Once cooked, remove, cut into halves, and serve. I saw this on “United States of Bacon.” Yum. Line a baking sheet with foil, then lay out the bacon on the sheet. Place in the oven and then heat the oven to 400 degrees. Set the time for 17 to 20 minutes. Once your bacon is cooked, pat the excess grease off with some paper towels. Lay out your pieces of bread and butter each piece. Cover each piece of bread with your cheese slices. Feel free to use more or less if you’d like. Core your apple then slice it into thin pieces. 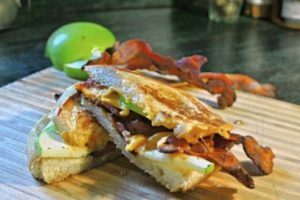 Layer your apple slices on 1 side of the bread for each sandwich. On top of the apples, layer your bacon! (Bacon strips will fit better on the bread if you cut them in half. Use as much bacon as you would like.) Place the other piece of bread and 3 slices of cheese on top of the bacon for each sandwich. Heat a griddle or skillet pan to medium heat. Butter the top of your sandwiches liberally with butter. Be sure to cover the whole piece of bread. Once your griddle is warm, place the sandwiches butter side down onto it. Lower your heat to medium-low and cover it with a lid if you have one large enough. After a few minutes, go ahead and flip the sandwiches. Cover again and grill for a few more minutes, until brown and toasty. Serve hot. Full of different flavors and textures, this probably will appeal more to grownups than kids. Peppercorns provide an unexpected zing. Place peppercorns in a sturdy plastic bag and use the side of a cleaver, a meat mallet or a heavy can to crack the peppercorns. You don’t want to crush them into a powder; you just want them to crack into smaller coarse pieces. In a small bowl, mix together goat cheese and milk until smooth and creamy. If mixtures is stiff, add more milk 1 teaspoon at a time. Add apricots, honey, peppercorns and thyme and stir until well mixed. Brush one side of each of the bread slices with oil. Place 4 slices of bread, oil side down, on work surface. Divide and spread goat cheese mixture on the bread. Top with remaining bread slices, oil side up. Heat a large nonstick skillet over medium heat for 2 minutes. Put sandwiches into pan, cover and cook for 3 to 4 minutes, until golden brown. Flip sandwiches, pressing each one lightly with the spatula to flatten slightly. Cover and cook 3 to 4 minutes, until golden brown. Turn the sandwiches 1 more time, and cook for about 1 minute, or until the filling appears to be heated through. Remove from pan and cool for 5 minutes. Cut in half and serve. Simply put, this is decadence on a roll. Butter one side of each slice of bread and place on a medium-high heat flat top griddle (butter side down), arrange cheeses on the bread open-faced, placing cheddar first on one side and blue first on the other (since the take longer to melt). Once bread has begun to brown lightly and cheeses are warming almost to melt temperature, fully assemble sandwich using a spatula and press lightly on both sides. Place a domed lid over the sandwich to complete melting. Who says a grilled cheese needs a top and bottom? This open-faced sandwich takes about 2 minutes to make, and is cheesy-delicious. Lightly toast the bread under the broiler, then top each slice with a little cheese, the pickle and more cheese. Broil until cheese melts and the edges of the bread get crisp and browned. Serve right away, cut into quarters. A pinch of saffron gives this quick, delicious soup a more complex flavor. I used imported La Valle San Marzano tomatoes from Pennsylvania Macaroni. In a large pot or Dutch oven or pot, heat the olive oil over medium heat. Add the onions and cook over medium-low heat for 15 minutes, stirring occasionally, until golden brown. Add the garlic and cook for 1 more minute. Stir in the chicken stock, tomatoes, saffron, 1 tablespoon salt and 1 teaspoon pepper. Bring the soup to a boil, then lower the heat and simmer for 15 minutes. Remove soup from heat, and allow to cool slightly. Carefully puree soup in a blender until smooth (you may have to do this in batches; I used an immersion blender right in the pot). Return soup to the stove over low heat and stir in half-and-half. Taste and adjust seasoning as desired. 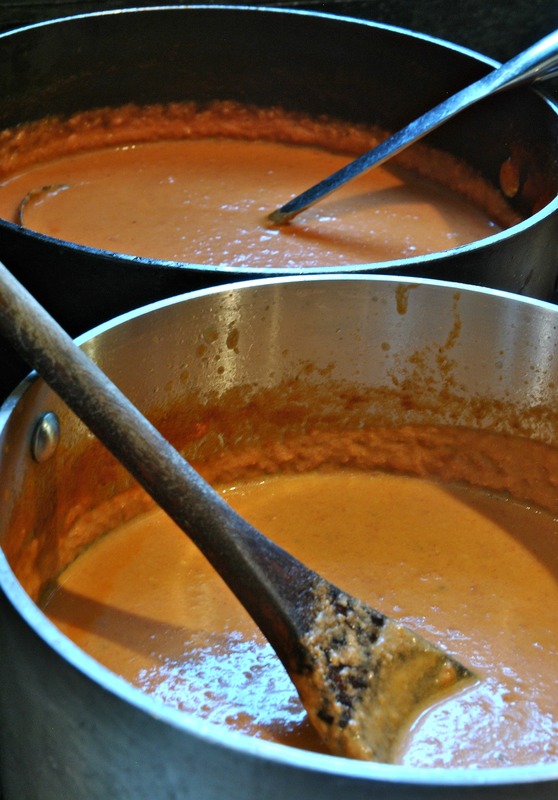 Bring soup to a simmer and cook for 10 more minutes, stirring frequently. Serve hot, with grilled cheese sandwiches.